HOLDEN BEACH – The fourth and, at least for the moment, last federal draft environmental study to build a terminal groin on a North Carolina beach is out for review. The Army Corps of Engineers recently released its draft Environmental Impact Statement, or EIS, for the proposed construction of a terminal groin on the east end of Holden Beach in Brunswick County. The town’s preferred project includes a 1,000-foot-long structure that would extend about 700 feet into the ocean. The remainder would anchor the groin to shore. The proposed project would be within the Lockwood Folly Inlet and encompass about a mile of oceanfront shore. Under the shoreline protection plan, Lockwood Folly would be dredged every four years for the purpose of beach re-nourishment. Like other beach towns along the coast seeking similar projects, officials in Holden Beach believe a terminal groin will relieve the east end of chronic erosion. 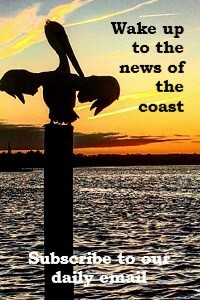 Holden Beach Mayor J. Alan Holden did not return calls seeking comment. Holden Beach is the fourth North Carolina coastal town to apply for an application to build a terminal groin. The town may be the last to do so, according to current state law, which allows four hardened structures to be built on the coast following a 30-year ban lifted in 2011. A special provision recently tucked into the state budget, which continues to be in negotiations, would raise the limit to six, according to the Raleigh News & Observer. Rep. Pat McElraft, R-Carteret, told Coastal Review Online earlier this month that the Senate injected the provision during deliberations over funding to keep Oregon Inlet from clogging up due to shoaling. Sen. Harry Brown, R-Onslow, one of the N.C. Senate’s budget writers, later confirmed that a provision will be included in the budget but that it would allow groins to be built at New River and Bogue inlets. The subject of weeks of meetings, a proposed state budget for 2015-16 is expected to be released today. Environmental groups such as the N.C. chapter of the Sierra Club oppose lifting the cap on terminal groins, saying that such a major policy change should be openly discussed. 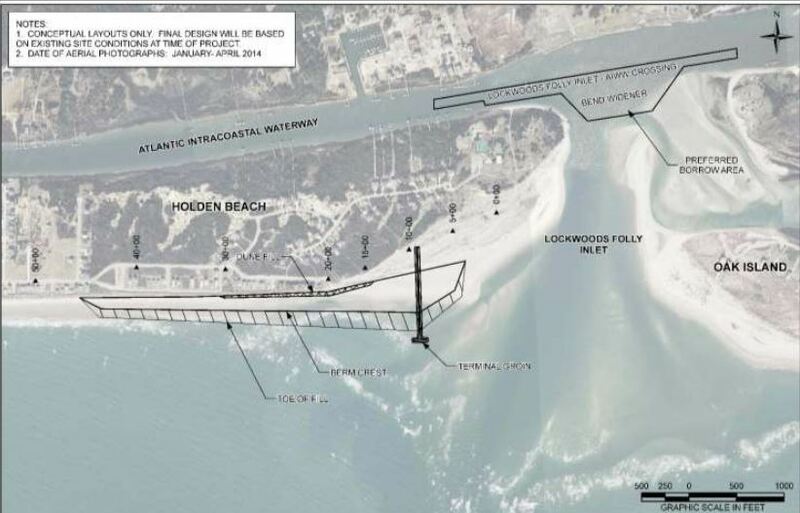 Construction of a terminal groin on Bald Head Island in Brunswick County is underway. Federal environmental studies for Figure Eight Island, a private community in New Hanover County, and Ocean Isle Beach in Brunswick County are ongoing. 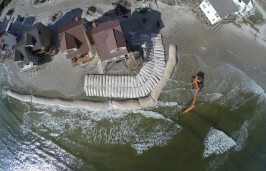 In Holden Beach, town-sponsored projects have pumped a little more than 825,000 cubic yards of sand on the east end beach, but it has primarily depended on federal navigation maintenance dredging projects to re-nourish the two-mile stretch of beach where the highest erosion occurs. Facing an uncertain future of federal funding for beach nourishment projects, the town decided to pursue a 30-year shore protection project. “Rather than just alone depending on the federal projects and the scheduled beach re-nourishment projects they’re looking at this as an additional, more long-term project,” Hughes said. According to the draft EIS, the average long-term erosion rate along the east end of Holden Beach is among the highest in the state. That rate ranges from three feet to eight feet a year. 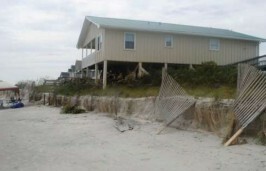 Within the past two decades, erosion has destroyed nearly 30 oceanfront properties, including houses and town infrastructure. A 2010 report produced by the coastal engineering firm Moffatt & Nichol determined that more than $27 million in property is at risk on the beach west of Lockwood Folly Inlet. 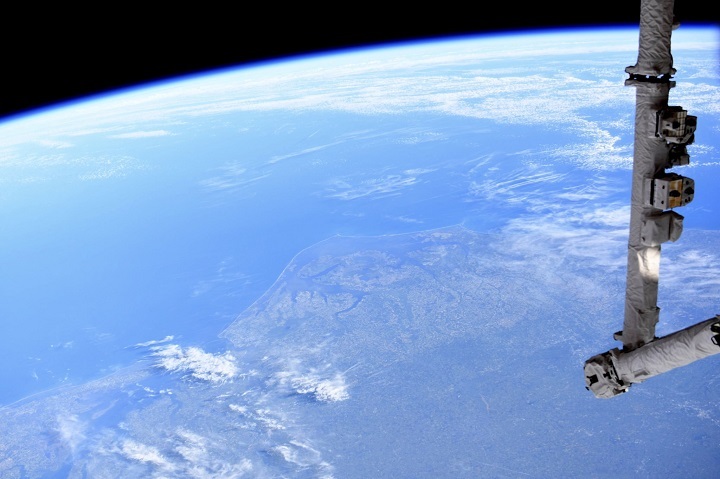 The draft EIS includes a handful of project alternatives, the preferred of which is a groin built of four-foot to five-foot in diameter granite armor stone to allow sand to pass through the structure. The proposed project will not impact wetlands, according to the draft study. 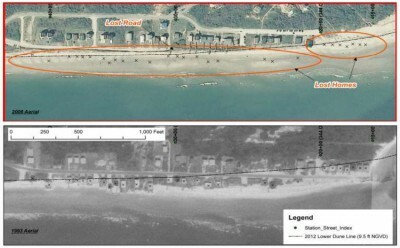 A portion of the rock wall crossing dry beach would be buried, the study states, to maintain recreational beach access. The Corps has not formally initiated the National Environmental Policy Act, or NEPA, consultation process with federal agencies that oversee the protection of endangered and threatened wildlife, including the National Marine Fisheries Service and U.S. Fish & Wildlife Service. “That process should be starting in the next month,” Hughes said. The Corps will host a public hearing on Holden Beach’s proposed project at 6 p.m. on Sept. 24 in Holden Beach Town Hall. The public may submit written comments on the Corps’ draft EIS through Oct. 13. A final EIS is expected to be released sometime next year. If the town receives the required federal and state permits to build a terminal groin, construction may begin during the winter of 2017, Hughes said.